With school being in full swing, I thought everyone could use something a bit easier to make, and what could possibly be easier than muffins? Muffins pretty much make themselves. Actually not really, because it’s hard for batter to mix itself… not to mention somewhat magical & Harry Potter-ish. But you know what I mean. Back when my grandma passed away unexpectedly in July, we were inundated with beautiful cards & amazing e-mails & gorgeous flowers, etc. It was so wonderful to have people reach out that way. One of the things we received was a HUGE Harry & David gift basket sent by some high school friends of mine. I think my mother & I might have lived off of that basket for the first few days we had it. For dinner we’d have Moose Munch & butter toffee chocolates or strawberry licorice rope & yogurt pretzels. It was a heatwave, we were in a daze and we had absolutely no desire to eat let alone cook. But snack? Sure. A handful of popcorn & candy here & there got us through the days without crashing from low blood sugar. Of course, there are always a few things left at the bottom of the basket. One of them was trail mix. Don’t get me wrong- there’s nothing wrong with trail mix. 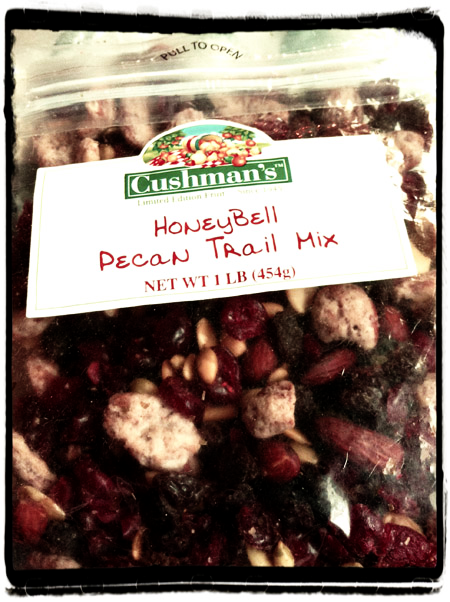 Especially not gourmet Honeybell Pecan Trail Mix. But let’s face it, when there are piles of delicious candy on top of it, what are you going to choose to eat first? Probably not the trail mix. Needless to say, in any gift basket, those are the things that are eaten first, but especially with us. We’re candy people. Chocolates always trump dried fruits around here. It contains: Honey Bell pecans (pecans coated in a mixture of butter, sugar and oil of Tangelo [Honey Bell] flavoring), dried cranberries, raisins, almonds, pumpkin seeds and roasted cashews. A great fall breakfast muffin, right? Not only that but it would use up that trail mix that was sitting there all lonely. All I did was I altered my favorite chocolate chip muffin recipe to include trail mix & some oats. Of course, I added considerably more trail mix than I did chocolate chips, then sprinkling the tops of the unbaked muffins with oats. Preheat oven to 400° F. and grease up twelve muffin cups or put liners in them (I prefer liners because it’s less messy that way). In a large bowl, stir together flour, sugars, baking powder, and salt. In another bowl, stir together milk, eggs, butter, and vanilla until blended. Make a well in center of dry ingredients; add milk mixture and stir just to combine. Stir in trail mix. DON’T OVERMIX THE BATTER. 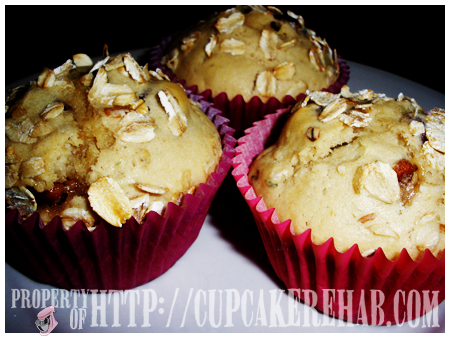 Spoon batter into muffin cups, filling them almost to the top; top each muffin with oats. 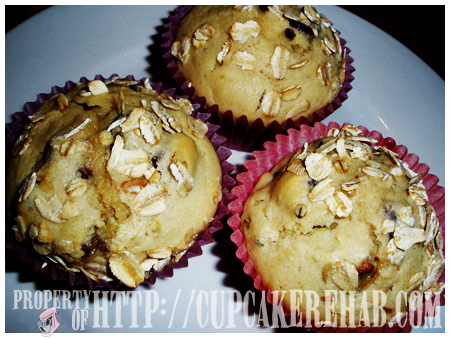 Bake 15-20 minutes, or until a knife inserted in center of one muffin comes out clean. Now that school’s open again & everyone is busy, they’re fantastic to pack in a kid’s school lunch or to send them off with in the morning for a quick breakfast when you’re (or they’re) running late. Even as an after-school snack. You could add some peanut butter chips or white chocolate chips, maybe some yogurt covered raisins, or even regular chocolate chips to it, if the mixture doesn’t include them. Some shredded coconut or coconut flakes. Maybe substitute buttermilk for the regular milk? And of course, you can use any trail mix at all. Or even just a mix of whatever dried fruits/nuts you like. If you want to make them healthier, use whole wheat flour, substitute applesauce or coconut oil for the butter and use honey or agave nectar instead of sugar. Add some oat-bran, make a streusel topping- the possibilities are endless! Eat one toasted with some fresh cream butter, homemade jam or marmalade, or just have it room temperature as a snack. I’m told they’re best warm out of the oven, though. However, since that little cold snap is over, & right now it’s about 100° degrees & humid as all get out in NY, I can’t imagine having the oven on to make more of these. This weekend, though, the baking is ON again. Get psyched. or if I have something to valuable to contribute to the discussion. Usually it’s triggered by the sincerness communicated in the post I looked at. Pretty nice post. I simply stumbled upon your weblog and wished to mention that I have truly loved browsing your blog posts.